WASHINGTON, DC (January 30, 2018) – Ahead of President Trump’s first State of the Union address, Iraq and Afghanistan Veterans of America (IAVA), the leading non-partisan Post-9/11 veterans empowerment organization, surveyed its 425,000 members nationwide. 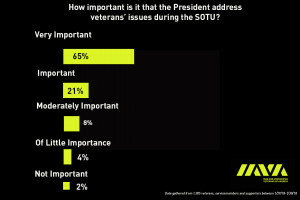 With over 1,000 respondents, the majority of IAVA members who responded plan to watch the State of the Union, and they believe it is important for the president to elevate veterans issues when he addresses the nation. The key veterans issues they want to see the president address are veteran suicide, VA reform, employment, education benefits and women veterans. Methodology: Emails were sent to IAVA’s members inviting them to participate in IAVA’s short survey on the State of the Union. 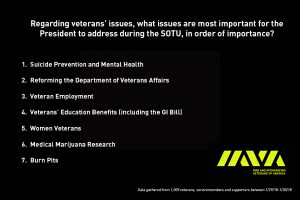 The survey was also distributed through IAVA’s social media channels. The survey was available from 1/29-1/30/18. Over 1,000 service members, veterans and supporters participated and completed the survey. The results represent only data collected from the military and veteran community.